* Expanded product ranges represent the market’s leading choice in terms of fly tying bead colors, sizes and quality. * New “Attractor” colors provide fly tiers with exciting possibilities to create new fly patterns. * Hook & Bead Compatibility Guide project launched to the fly tying community. CHARLOTTE, NC, USA – May 2, 2009 – Flymen Fishing Company announced the addition of 4 unique colors to their leading ranges of tungsten and brass fly tying beads. In addition, they have launched an open fly tying community project to further develop their Hook & Bead Compatibility Guide. Flymen Fishing Company has expanded their ranges by adding four unique Attractor colors: Steelhead Blue, Bloodworm Red, Shrimp Pink and Tangerine Orange. These bead colors are possible due to an anodizing process that creates a permanent, high-quality coated finish that is superior to older-style painted or enamel-baked beads. The new colors are being added to the existing “Traditional” and “Natural” color options which include colors such as Caddis Green, Mayfly Brown, Stonefly Black and Baetis Green-Olive. “Since launching our Natural Fly colors in September 2008, our customers have been asking us to provide additional colors in our special anodized finish. Our Attractor colors like Steelhead Blue and Tangerine Orange will allow fly tiers to create distinctive beadhead patterns that were never before possible.” said Martin Bauden of Flymen Fishing Company. In addition, the company has initiated an open fly tying community project to create a comprehensive Hook & Bead Compatibility Guide to allow fly tiers to easily determine if a particular hook brand, model and size will fit a specific brass or tungsten fly tying bead. The Nymph-Head™ Pro Team consisting of 40 professional fly tiers has collaborated to create the first public version of the Flymen Hook & Bead Compatibility Guide. This is available for Free Download from the Fly Tying Resources section of the Flymen Fishing Co. website. The Project has now been opened up to the public fly tying community who are invited to participate and contribute towards the ongoing development of this guide as a useful fly tying community resource. 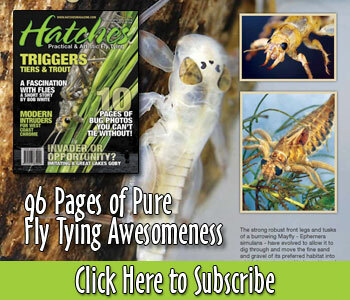 “We are taking the initiative to solve a very common fly tying challenge with this project. Fly tiers today are faced with an almost over-whelming choice of fly hook brands, types, shapes and sizes. As a result, fly tiers cannot be guaranteed that a particular fly tying bead will actually fit onto the hook until they try them. For example, a fly tying bead intended for #8 or #10 size hooks, may or may not fit around the bend of a particular brand and model #10 hook. This has the potential to make it extremely frustrating, especially if the fly tier has already purchased a quantity of hooks and beads only to find they simply are not compatible!”, Bauden explains. The unique design of the Nymph-Head™ tungsten bead improves upon the common, round bead by adding a pair of realistic 3D “Nymph eyes” as a key design feature. Available in 8 “Natural”, “Traditional” and “Attractor” colors and 5 sizes, Nymph-Head™ is the Next Generation of fly tying beads. They are the heaviest, most advanced, realistic beads on the planet with the widest range of color options. The most comprehensive range of round, Industry standard, countersunk fly tying beads on the market today. There are 9 unique “Attractor” and “Natural” Colors in a permanent, non-tarnishing anodized finish. Available in 7 bead sizes, they offer fly tiers the widest possible choice in terms of color, size and quality. Just dropped by to check it out…..still lookin’ good. Am looking for a very small olive bead maybe 3/32 or smaller…..just plain, no shine, etc. for some emergers. In dark tan too, but I will most likely end up painting those. Keep up the good work….. I would sure like tie this fly, can you send instructions.